Sir Paul McCartney could be set to get his hands back on the rights to The Beatles' songbook. According to music site Fader, Macca will be able to reclaim the rights for his songs in around five years' time, half of which had been bought up by Michael Jackson. Sony/ATV Music Publishing own the rest of the rights, but thanks to the US Copyright Act of 1976 which returns the rights of pre-1976 songs to their writers after 56 years, Paul could be poised to regain the hits Jacko bought up. The 71-year-old would get control of his 1962 compositions in 2018 and those from 1970 in 2026. Sir Paul's new album has had the help of some big name producers according to The Sun, including Mark Ronson, The Beatles producer George Martin's son Giles, Paul Epworth who works with Adele, and Kings Of Leon collaborator Ethan Johns. 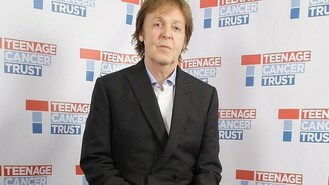 A source said: "Macca's team are very excited about the album. They hope it will take him back to the top of the pop charts. The people working with him certainly know how to do that." The first single is said to be on its way soon, with the album due out before the end of the year. Justin Bieber almost lost his trousers on stage, as they began to fall down in the middle of a concert. The Fisherman's Friends have turned down a chance to tour the US - because they would be too busy with their day jobs. Franz Ferdinand star Alex Kapranos has collapsed at a music festival - but still managed to perform later that evening. Lady Gaga has threatened hackers who leaked her new single on the internet, and asked fellow victim Katy Perry to join her. Miley Cyrus has shot straight to the top of the charts to score her first ever UK number one single with party tune We Can't Stop. Heavy metal pioneers Black Sabbath are to be named living legends at a music awards ceremony later this year. Jennifer Lopez has collaborated with Sia for her new album. Pop sensation Rita Ora has pulled out of a live performance at a race track. Pink made one fan's day when she helped her propose during a show in Australia.